Sears Appliance and Hardware Stores and Sears Home Appliance Showrooms have the brand equity, expertise, premier service and customer loyalty necessary to execute a dynamic franchise system. We're looking for motivated individuals to join us in this exciting Sears store format that fulfills the needs of your customer. The Sears franchise combines a powerful blend of products and services along with the entrepreneurial spirit of local business ownership. The power of the Sears brand name. Significant consumer-level marketing as well as Kenmore®, Craftsman® and Diehard® branding efforts. Sophisticated operating systems, including Point-of-Sale (POS), back office, sign production and inventory control. Top brands like Kenmore®, Craftsman®, Diehard®, Husqvarna®, Dewalt®, Black & Decker®, Maytag®, Whirlpool®, LG®, Samsung®, GE®, KitchenAid® and many more, to help attract consumers to your store. Nationwide service by the country's largest home services provider, Sears. Acceptance of the Sears Card, along with Visa, MasterCard, American Express and Discover Card which makes the buying experience convenient for your customers. Delivery and installation by trusted, highly trained professionals. Inventory owned by Sears- at no expense to you. Proactive price match plus policy. 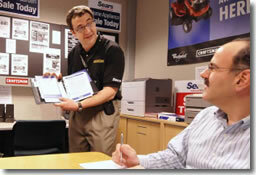 As a Sears Appliance and Hardware Stores and Sears Home Appliance Showrooms franchisee you will not have the concern of inventory selection, transportation costs or inventory financing, because we provide the inventory at no cost to you while our trucks and installers ensure a timely professional delivery experience. This approach allows you to focus on driving sales and managing your associates. Ready to become a franchisee? Sears Appliance and Hardware Stores and Sears Home Appliance Showrooms is selective in choosing franchisees, which we believe contributes to more successful franchises. We have found that business-savvy individuals who place a value on continuous marketing efforts make for the most successful Sears Appliance and Hardware Stores and Sears Home Appliance Showrooms franchisees. The capabilities to own and operate multiple locations are very important to us. As a result, we prefer if a franchisee owns other franchises in non related industries. Submit your information now and we will contact you shortly! Currently, the following states regulate the offer and sale of franchises: California, Hawaii, Illinois, Indiana, Maryland, Michigan, Minnesota, New York, North Dakota, Oregon, Rhode Island, South Dakota, Virginia, Washington, and Wisconsin. If you are a resident of one of these states, we will not offer you a franchise unless and until we have complied with applicable pre‑sale registration and disclosure requirements in your jurisdiction. Please note, this franchise is only accepting inquiries from CT, DC, DE, FL, GA, IL, IN, KY, MA, MD, MN, MO, NC, NJ, NY, OH, PA, TX, VA, and WI. Interested parties should have at least $100,000 to invest. 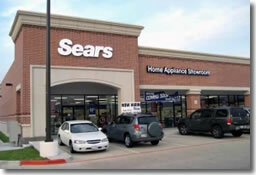 Click on Request Information for FREE info on how to open a Sears Home Appliance Showrooms franchise today! Please Note: This Sears Home Appliance Showrooms franchise opportunity and other franchise business opportunities, businesses and franchises for sale on this web site are not to be considered as an "offering", "franchise offering", suggestion or recommendation by Franchise Leader™. This advertisement depends entirely on the truthfulness of the information provided by our advertisers which includes, but is not limited to, franchisers, franchise brokers, franchise consultants and business brokers. Franchise Leader™ recommends that you consult a lawyer, financial consultant, accountant or professional advisor before buying a franchise or business opportunity or any type of business. By using this form or any part of our website, you have agreed to all terms and conditions of Franchise Leader™. Please review our Terms & Conditions for more information.